Paeonia Red Charm is undoubtedly the best known and most popular red peony available. Also it's one of the earliest available double-flowered varieties of the season. We love the round flowers because they have a perfect shape and can grow to be as large as 22 cm. Compared to other varieties the vase life of about a week may seem somewhat short. On the other hand, it also gives this peony a certain uniqueness and…charm. Short-lived, but powerful: that’s Paeonia Red Charm! 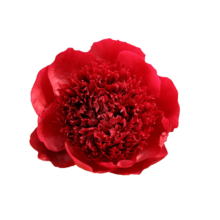 Red Charm is a hybrid, full-petalled peony with ball shaped flowers. Red Charm blooms very early in peony season and is one of the earliest available double-flowered peonies. While the stems remain shorter than other varieties they are very thick and strong. Back in 1944 the American peony breeder Glassock registered Red Charm for th first time. Glassock is also known for Old Faithful and Red Grace, the main competitors of Red Charm. It was awarded a gold medal by the American Peony Society in 1956. Although Red Charm is a fantastic peony that blooms explosively, it tends to shed some of its petals after blooming. In order to clean up more easily it might be a good idea to put a small rug under your vase.